Hungary: â€œIt is a great pleasure to see the posters of your own films in this part of the world highlighting 100 years of Indian Cinema. I am elevated and impressed by the festival organizers to include all this as a part of main eventâ€ said Sandeep Marwah President of Marwah Studios and Chief Guest of the Jameson Cinefest-11th Miskolc International Film Festival, Hungary while inaugurating the poster exhibition of Indian cinema. â€œWe have achieved a lot in cinema, it is the time we must showcase our talent through these festivals all over the Worldâ€ said H.E. Malay Mishra Indian Ambassador to Hungary. Jameson Cine Fest-The 11th Miskolc International Film Festival this time focused on India. 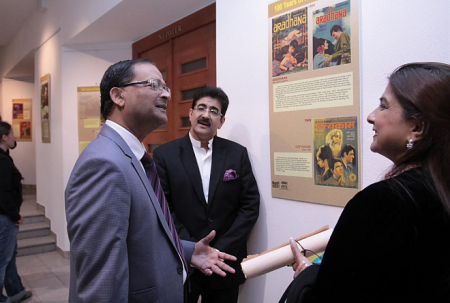 It showcased Indian cinema, dances, Indian food, interaction with Indian film personality Sandeep Marwah on India Day and poster exhibition depicting 100 years of Indian Cinema, informed Tibor Biro the festival director. Large number of important dignitaries, film critics, filmmakers, jury members and film lovers were present at the inauguration of exhibition.